Less than a year ago, 35 year old Wings & Things restaurants changed its name to Epic Wings & Things. Now, the newly named company is serious about adding craft beer to its list of “Things” on the menu. Read what San Diego based West Coaster craft beer magazine has to say about Epic’s new venture into suds. 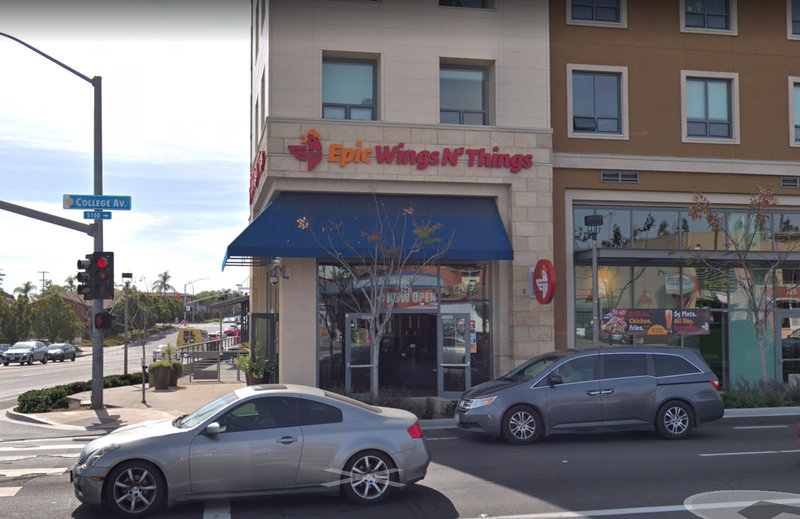 Pictured is Epic Wings & Things brand new location near San Diego State University (College and Montezuma sts). GUEST BLOG / By Westcoastersd.com--Epic Wings has been a local, family-owned and operated business for more than 35 years. Over that span, it has grown to include 20 stores (including three in south Riverside County and one in Mission Viejo), all of which are operated by different members of the family as well as franchisees. Until recently, they did business under the name Wings N’ Things, but a rebrand was instituted earlier this year. And while the new moniker will be applied to a soon-to-open 21st location, the family will need to come up with a new name for a brewing operation that will be sited there. The upcoming store will be located at 1054 West Valley Parkway in Escondido. Like its sister venues, it will serve a variety of chicken wings and tenders, plus bread sticks and salads. However, this will be the only location to have a brewery under its roof. The decision to dive into the brewing game was made by co-founder Cathy Russo and her daughter Francesca, who, in addition to this project (which will go by the handle Epic Wings N’ Things), owns the company’s San Marcos store. That location features a bar with 10 taps serving a variety of craft beer, leaning largely to those produced by local breweries. The Escondido store will feature a similar bar, and its beer-making capabilities are a next-level representation of Russo’s faith in the appeal of local, independent ales and lagers. The restaurant component of the Escondido location is projected to open in early 2019. As far as the brewery, Russo and company are in the early stages of planning and still need to hire a lead brewer. Architecture for the brewery is the charge of Hauck Architecture, and the project is expected to be completed toward the middle of next year. Epic Wings is the fourth established, San Diego-based restaurant chain to enter the brewing industry this year, following in the footsteps of the Brigantine’s Ketch Brewing in Kearny Mesa, Serra Mesa’s Hodad’s Brewing, and the Cohn Restaurant Group’s La Mesa work-in-progress, Draft Republic Brewing. Like the others, Epic Wings has no plans to nix beer produced by other breweries from its overall offerings.